I’ll be the first to admit I have too many books. They’re in every room in the house: bedrooms, office, family room, living room and workshop. Everywhere except the bathroom. With a few exceptions, the ones in the workshop are special purpose. It’s there I have my reference books for all our vehicles, including the motorcycles. Those reference works are security blankets. They’re a holdover from my early teen years, where bicycles were my entryway into the world of mechanics. Too young for a driver’s license, I loved bikes and the freedom of travel and promise of adventure they provided. The bicycles – especially my first 10-speed – were a prelude to motorcycles, of course. They were my vehicles of discovery, my very own Santa Maria and Mayflower and Susan Constant. I recall getting the same thrill of anticipation when buying my BMW R1150GS in 2000 as I did when I got my Fuji S-10S in 1975. My high school friends and I learned to work on our 10-speeds. Tom McCray and I can still joke about the satisfaction (and amazement!) we got when we figured out the last mystery and learned how to adjust the rear derailleur to hit all five cogs in the freewheel. It was like we were freaking magicians, man. A lot of that knowledge came through books. I still have ancient copies of the books we used; one of them is “Two Wheel Travel: Bicycle Camping and Touring,” which still has grease stains on the illustration across pages 90 and 91 which helped me rethread a chain around the jockey and tensioner cogs of a derailleur. That’s a really great book, by the way, and the authors wrote a helpful companion book devoted to motorcycles. “Anybody’s Bike Book,” by Tom Cuthbertson is another great bicycle reference, with excellent drawings and clear directions. 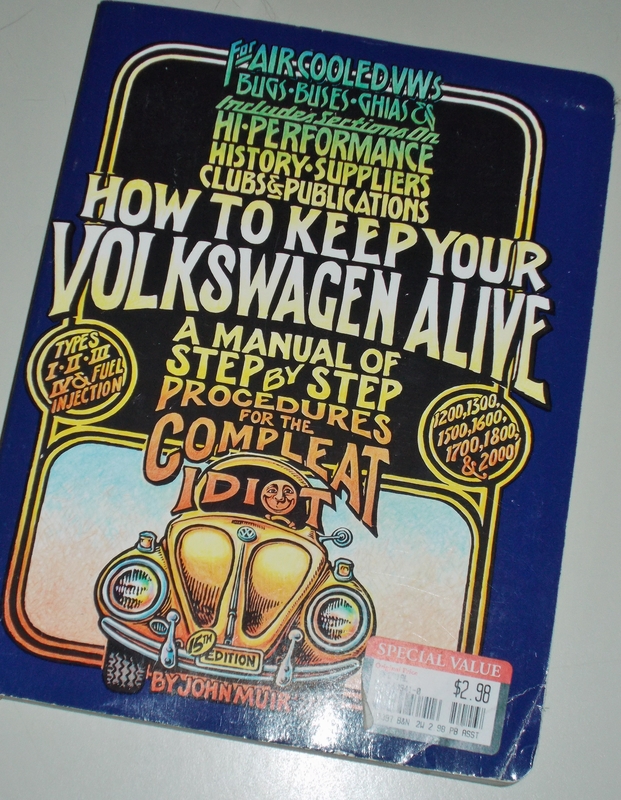 When I finally started driving, I discovered one of the best manuals of all time, “How To Keep Your Volkswagen Alive, A Manual of Step by Step Procedures for the Compleat Idiot,” written by John Muir with illustrations by Peter Aschwanden. That was the book that convinced me I could do it, I could wrench on my Bug and on other things. Even though I seldom consult them these days, I still keep those books around. Muir’s manual is just down the shelf from all the motorcycle references crammed into makeshift shelves in the workshop. I pull out those books whenever I pick up any tool for the motorcycles. I check what I’m doing because I don’t want to make any expensive mistakes. I leave oil stains and scribbled notations on pages for future reference. Sometimes those marks and smudges remind me of past labor on machines, the way I can look at the page 90 illustration and recall working on my AMF Roadmaster in my father’s garage decades ago. That’s the security of manuals. Working on the bikes, I may fumble about, but the manuals bring me back. And all of those pages led here. We have some of your books… No, I have not taken up bicycle or motorcycle riding at this stage in my life. I am reading one now… Jupiter’s Travels by Ted Simon. Good book of adventure with travel, culture and musings! The books on our shelves define us: what matters to us, where we have been or where we would like to go!